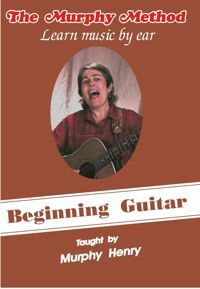 Beginning Guitar: Young or old, if you’ve never picked up a guitar in your life this is the place to start. Ditto if you’ve tried to learn guitar from written music or tablature and have had an unpleasant (and non-productive) experience. We can help! We assume you know nothing about guitar playing, and therefore start at the very beginning. (A very good place to start!) We guide you one step at a time starting with simple, two-chords songs. You will learn four chords, G, C, D, and Em, and the basic bluegrass strum. Step-by-step, we will teach you to play 16 well-known songs using just these four chords. Along the way you will get some excellent ear training, which is the key to playing with other people. We also show you how to use a capo and discuss playing in different keys. Three chords and a capo and you’re ready to jam! No Tab.